Presentation House Gallery is exploring the future of photography through the lens of 15 emerging Vancouver artists in its new exhibit, Phantasmagoria. According to director/curator Reid Shier, the exhibit is an informal sequel to the gallery’s two previous exhibits, C. 1983 Part 1 and 2, which looked back on a high point in Vancouver’s artistic landscape when photography went from being considered a second rate tool to taking its place as a fully fledged art form on par with painting or sculpture. Thirty years later we stand at another crossroads in photography with the near disappearance of film and the ubiquity of digital cameras. Image manipulation, which was once a painstaking mechanical process, is now accomplished by a few clicks of a mouse. Although it’s impossible to draw a neat through-line between the works, most do respond to digital photography in some way, if only because of the technology’s massive presence in our relationship to the visible world. Some make a direct connection, such as in Christopher Brayshaw’s manipulated Google Street View images, which are culled from the vast archives of digital images now readily available to shape our idea of cities. Others, however, eschew digital technology altogether in favour of older techniques. This is true of Rachelle Sawatsky’s installation in which she projects painted slides onto blank walls using several broken projectors which shudder and blow warm air. The noise and heat from the machines remind the viewer of what moderates our experience of the images. Viva Award winner Ron Tran’s series of sun prints of crystals on photo paper goes even further down the technological ladder. Because they are not fixed, the delicate images will degrade and eventually disappear, unlike modern digital photography, which maintains its form indefinitely. Meanwhile, Julia Feyrer’s cyanotype print on watercolour paper uses a technique that was discovered in 1842 and popularized largely by engineers. Probably the least high-tech of the collections is that of Raymond Boisjoly who printed his photographs on transparency paper and then laid the images on construction paper and left them out in the sun to bleach. The result resembles afterimages or patterns drawn in dust. Still others find ways to mix old technology and new. Dan Siney’s work combines painting and photography to comment on the longevity of the digital image. He physically or digitally manipulates large prints in a way that replicates the ghostly quality of damage from time and wear. Elizabeth Zvonar’s digitally enlarged collages use images she found in issues of the French magazine Connoisseur from 1968. She was interested in the relationship between the culture of conspicuous consumption represented in the images and the general strike that paralyzed Paris in May of that year. On the more playful side, Evan Lee’s collages manipulate the idea of vision by layering images of optometrist equipment he purchased online. Shier points out that the work also often takes the form of physical sculpture, which the artist filters through a digital lens and then returns once again to the physical form of a photograph. 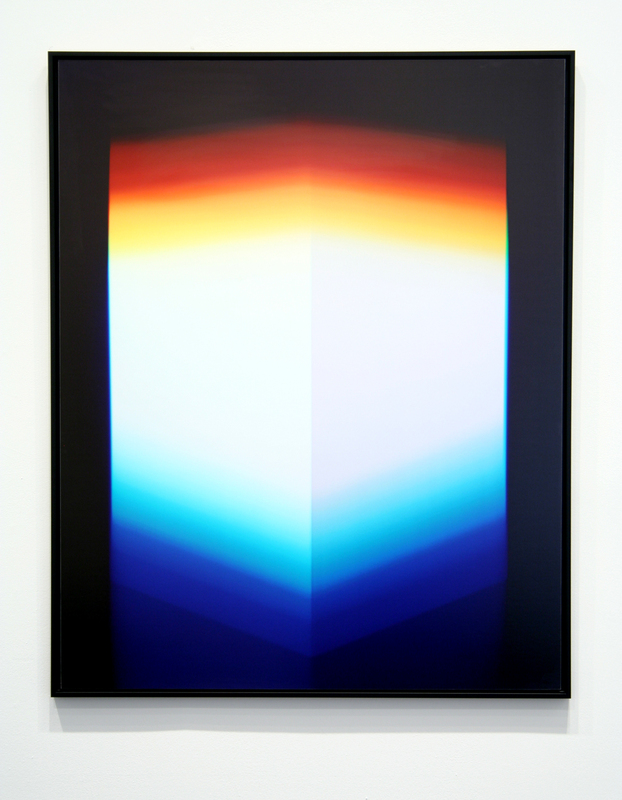 Mathew McWilliams created his series by manipulating a surface such as canvas or paper, photographing that surface and then printing the photo-graph on the surface at a slight remove. Jessica Eaton’s unearthly cubes seem to glow because of the way she moved the camera while taking long exposure photographs. Corin Sworn and Allison Hrab-luik both use photography to abstract physical objects. Sworn does it through photographs of paper sculptures and Hrabluik’s does it using a video of bouncing light with musical accompaniment. The exhibit also includes two digital collections available on the gallery’s website. Free by Jay Bundy Johnson is a heavily curated collection of Craigslist free stuff photos that takes a playful look at the way vernacular photography treats the detritus of our consumer lifestyle. Kevin Schmidt’s The End of the World is a work in progress. It takes the form of a growing collection of signs heralding the apocalypse, a record of our cultural obsession with the end times. He is accepting submissions.